A Discussion on Snath/Blade Fitting. 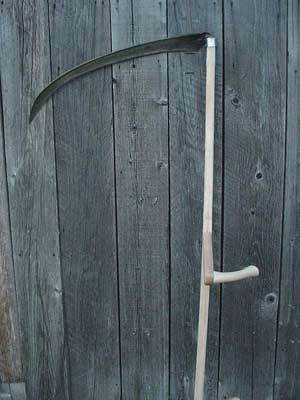 the sideways tilt, which affects the horizontal balance of the scythe. We will address these one at a time in the following pages. Click each image for a large version. Regardless of regional mowing styles, there is a nearly universal agreement among mowers with respect to the blade’s lay. Under most mowing conditions, the blade should move over the ground as pictured in A. B and C are both “wrong”–although under some conditions a certain amount of deviation from the “ideal” is acceptable or even desirable. 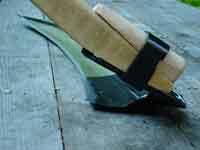 the edge is more prone to damage (because some slicing into the ground is inevitable). 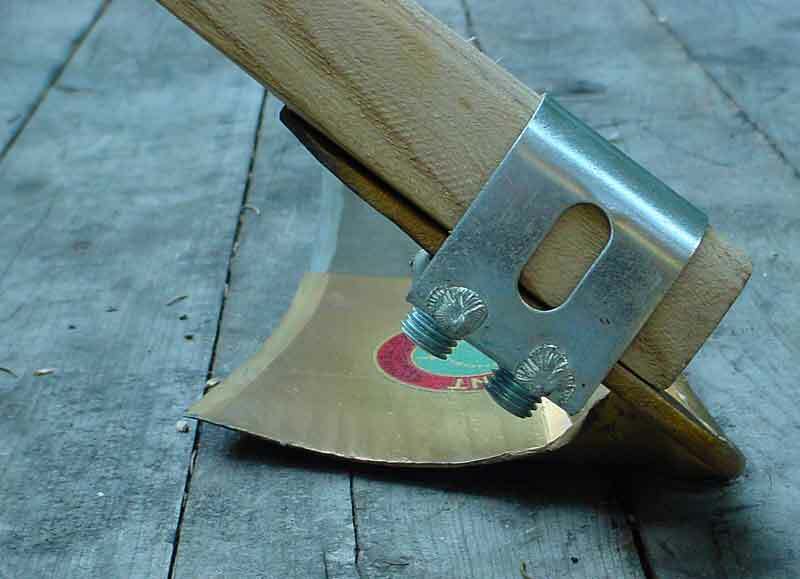 Thus we recommend that the lay shown in C is used only momentarily when one wishes to trim something very close to the ground (perhaps a clump of larger-diameter woody stems which, if cut off too high, may damage a thin-edged blade during subsequent mowing); or in an “emergency” in order to compensate for a dull edge, in short/soft/dry grass. 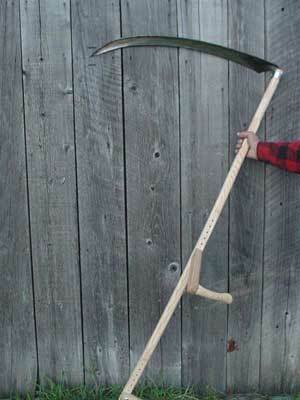 The “adjustment” is made up by tilting [lowering] the scythe as needed. 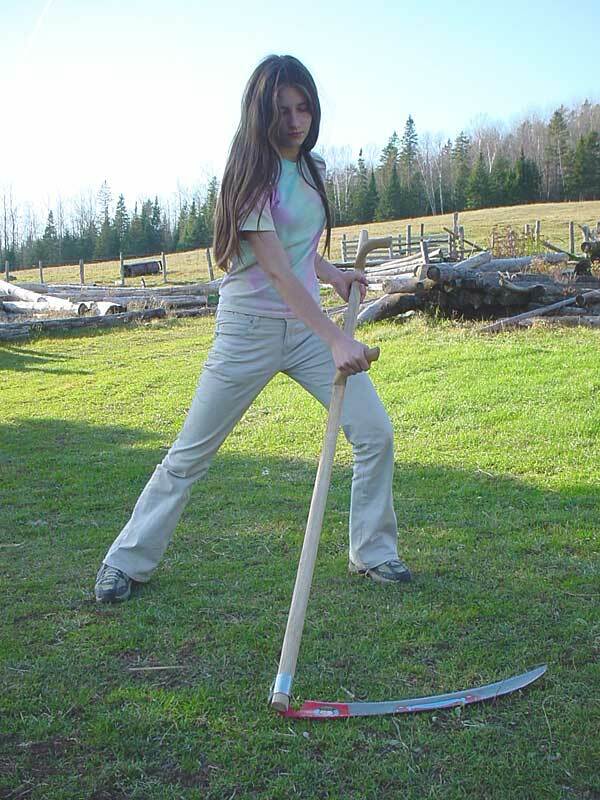 If you have been using a scythe this way, i.e. 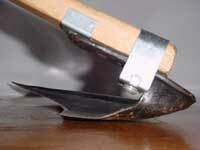 with the edge needlessly eating grit, try inserting a wedge as shown in Fig. 2 below; you may be in for a revelation…. Some options of adjustments regarding the lay. Click for large versions. Fig. 1: snath’s lower end “unaltered”. 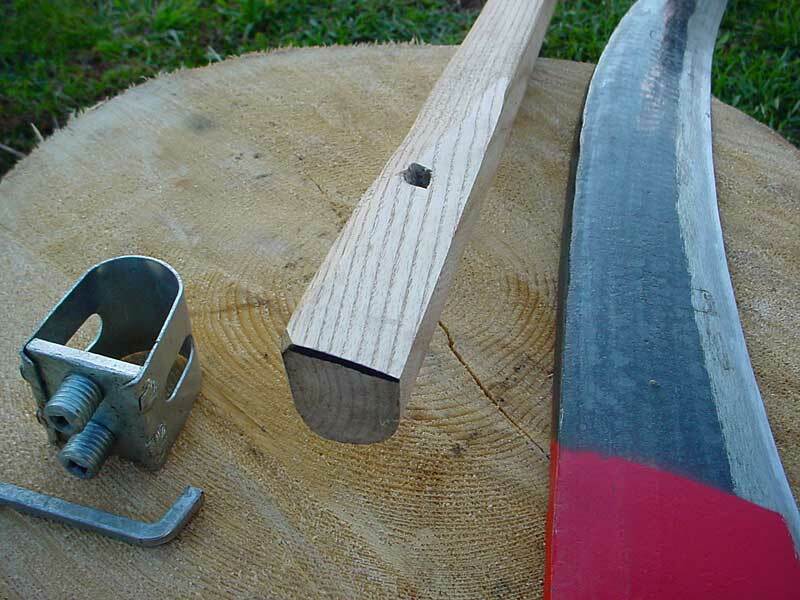 The blade is attached to the flat underside of a snath made from 1 1/4″ x 1 1/4″ sawn lumber. 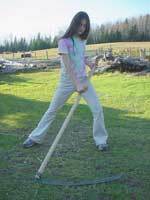 This, for instance, is likely to be a good arrangement for a six-foot-tall user: the Eastern-style snath and a blade with approx. 35-degree tang (i.e. most Belgian and Dutch models, some Italian ditch blades as well as many bush blades). Fig. 2: Snath’s end is the same as in Fig. 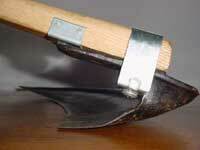 1, but in order to elevate the blade’s edge away from the ground surface, a wedge is used. This alteration, with any snath/blade combination, will have the same effect as if the person now holding the unit is somewhat shorter. For instance, a blade that works well on a straight snath for a six-foot-tall user will, if wedged, be suitable for a mower of five feet eight inches or so. Fig. 3 shows a snath’s end which is slightly tapered. 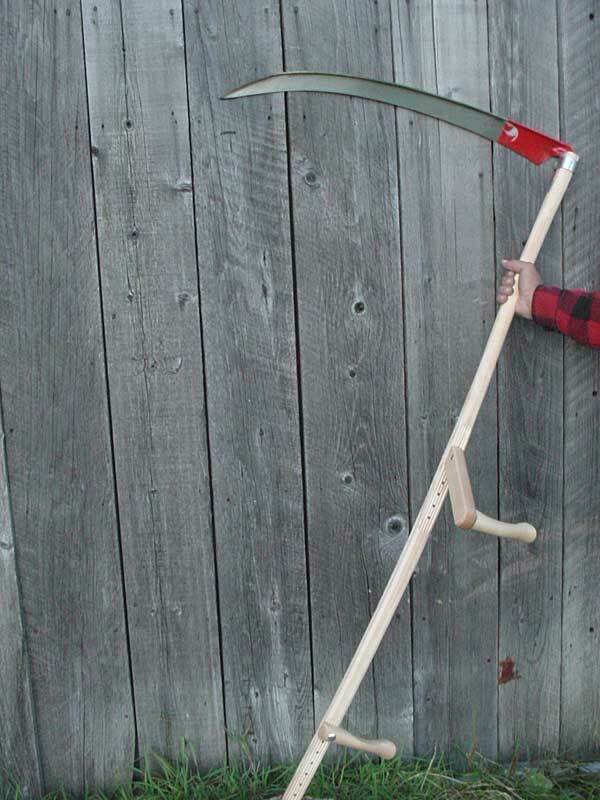 A six-foot-tall mower using the straight snath may be fine using this arrangement with a blade of approximately 25- to 30-degree tang. Fig. 4: A snath with a very acutely tapered end. For this arrangement the common set-screw type rings do not work well. However, the simple ring in the picture, held in place by a thick wedge, is a very common way of attaching a blade; many East European and other mowers prefer this method. It is in this manner that most Russian-made blades (the tangs of which are approximately 23-24 degrees) have been used on the straight one-grip snath in Slovakia by tall mowers. For this ring/wedge to hold better, the upper side of the snath’s end remains square, i.e. flat on top, instead of rounded as it would be in order to take the set-screw ring. All of the above alternatives can, of course, in principle be applied to fitting of blades to any style of wooden snath. I have studied the material on your website and have a pretty basic question. 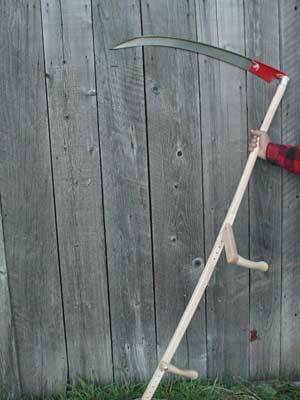 As an upright 6’5″ tall man (with tall sons), I should be considering blades with a tang steepness of 30 degrees plus? Peter Vido asked me to address your question, as I am 6′-8″ tall and have faced the same issue. I later wanted to try these same blades with a two-grip snath (homemade from straight lumber), so I designed the “Oregon Snath”, as shown in the above link. The adjustable two-grip snaths that are available from various sources are only adjustable for a certain range of heights, and this doesn’t really address the blade fit. Each adjustment of the snath might change the angle the snath makes with the ground, theoretically requiring a different tang angle. The maker of the snath should have this all figured out, but this isn’t always the case. I think that there is some fudging done, such as one or two tang angles used for a range of users, instead of having a wider range of tang angles available to properly fit the range of users. 1. the particular mowing style. Note 1. 2. the stem density of the sward. Note 2. 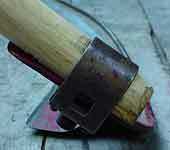 A percentage of the blades used in the Alps and some other regions of Europe are hafted “in circle”, that is, with the blade’s point as well as its beard both at the same distance from the upper end of the snath. A quick way to check this without a measuring tape is shown in Figure 1. A. The beard of the blade in line with the upper line marked on the wall. B. 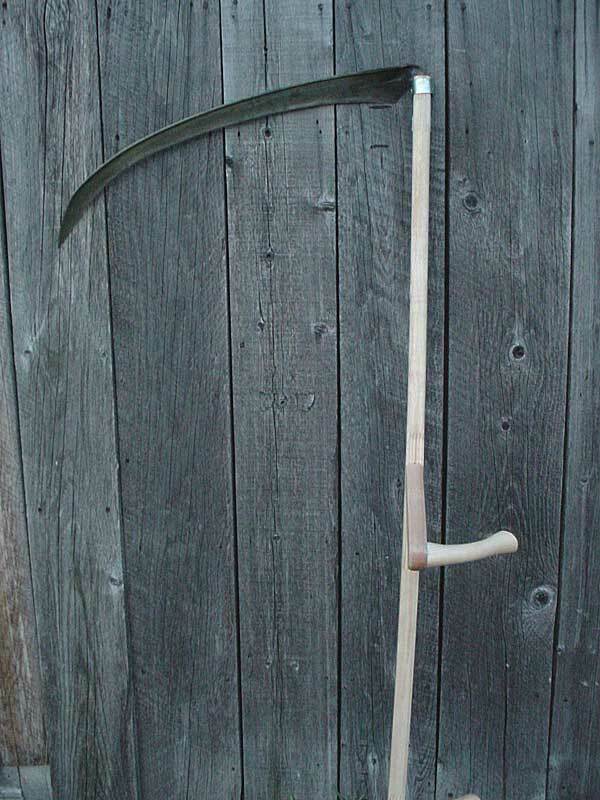 The scythe rotated to the right upon its axis, with the end of the snath remaining at the same place on the block of wood, until the point of the blade crosses the same point previously met by the beard. 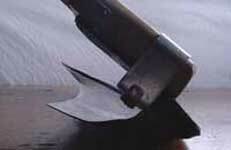 This blade is hafted in circle. This adjustment works well only if the stem density is not too high. Accordingly, many classical Austrian blade models mounted on common snaths will automatically provide a hafting angle “in circle”. 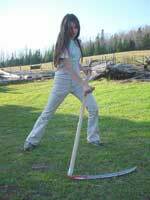 They were designed for the cutting of the typical Alpine meadow (which is not excessively dense). It was also a given that the mower would maintain a thin and well-honed cutting edge. Within these parameters –along with the very circular stroke–such a hafting angle works well. (By “very circular” we mean that the mower’s body movement consists principally of rotation in the waist, with little or no additional side-to-side motion of the legs. However, within each region of “in circle tradition” some mowers prefer a setting with the point of a 70cm to 75cm blade approximately 5cm/2″ below the upper line shown in Figure 1. The hafting angle is then more acute, or more “closed”. See Figure 2. Figure 2. Blade hafted 5cm./2″ below the circle. This, we think, is generally a far more useful setting. 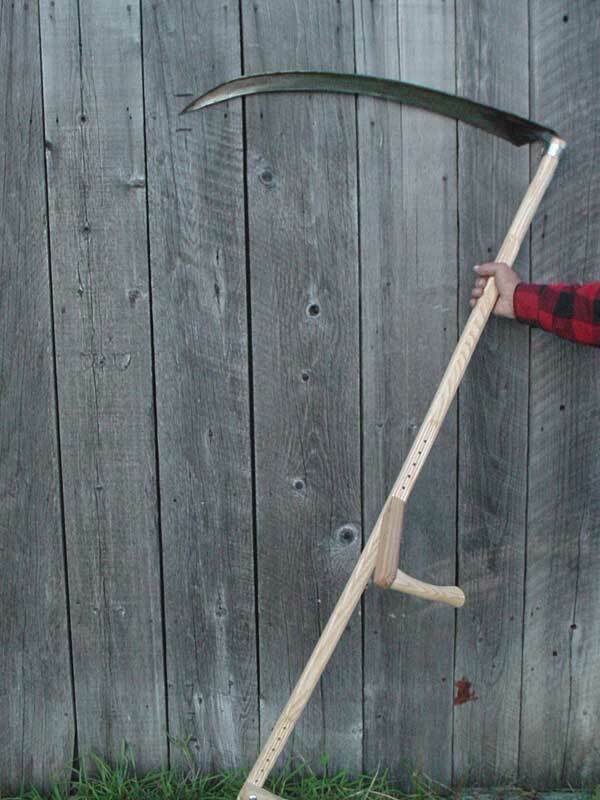 For the cutting of an extra-dense and/or tangled sward, or one containing “thatch” (an accumulation of cut or uncut material of previous seasons’ growth) or if, in addition, you shift your weight sideways (in the manner we teach), the point of a medium to long blade could be nearly 10cm./4″ below its beard. See Figure 3. Figure 3. A blade hafted even more acutely. None of the guidelines are set in stone. Our advice is that you try different settings, pay attention to the results and the respective effort they require in use, and then decide what is best for you. a) A wider (40mm.) ring is sometimes enough to solve the challenge. Note 1: Possibly the two extremes are the very semi-circular movement of the Alpine regions and the nearly straight-across stroke of the Basques. The respective “correct” hafting angles of these are such that if an Austrian or Swiss mower hafted the blade according to the Basque formula, he would have to use one of the Basque blade models and the same traditional movement, or the blade would cut virtually no grass. 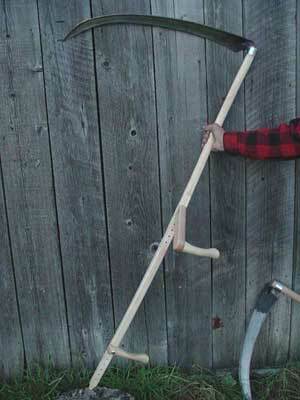 If on the other hand a Basque would mount on his snath the most typical Austrian blade and try to mow in his usual style, he would either get “stuck” halfway through the stroke or–strong as the Basques are–break the blade or the snath, because he would be asking the blade to “bite off more than it can chew”. 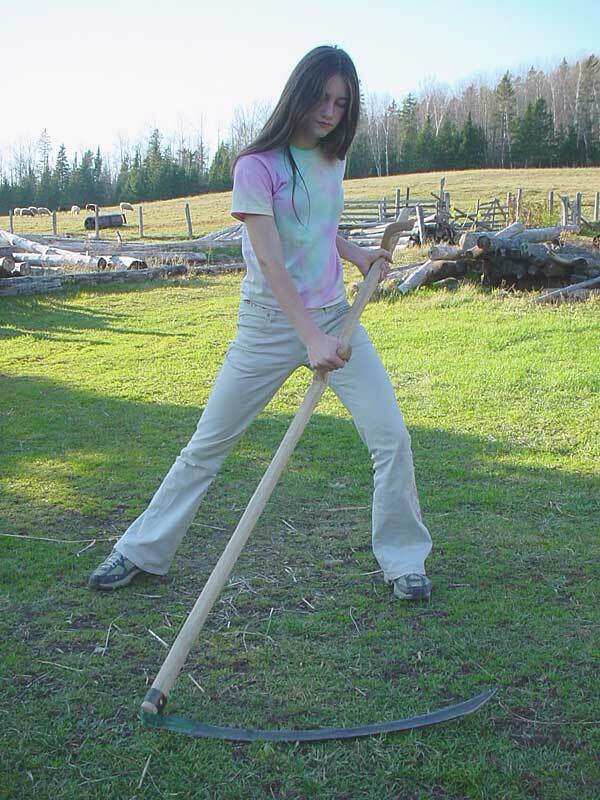 Note 2: Mowers probably never know the actual number of stems per square area; various stands are judged as “sparse” or “dense” by a visual assessment, and blades may be adjusted slightly whenever an unusual stand is encountered. Besides, even if one knew the exact number of stems per area, real life is often more colourful than an arbitrary classification based on head counts. Are the stems young and juicy, or are they old and tangled? Equally important, how sharp is your blade? The “sideways tilt” is the third (and least obvious) plane of a blade’s tang, inherent in the design of each model. Very few tangs (the American pattern being one example) are laterally level when the blade is viewed edge-on. The vast majority tilt to the left, i.e. toward the point of the blade. 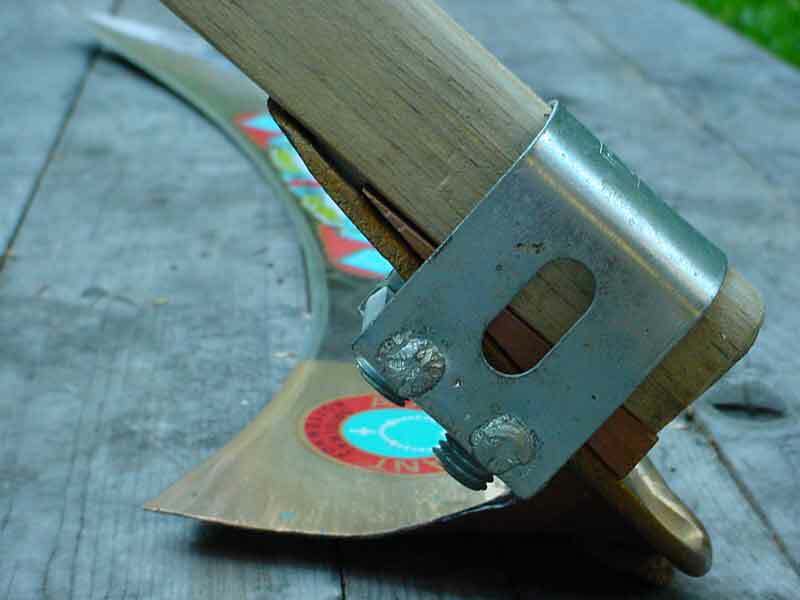 The angle of this tilt (indicated by the straight piece of wood) will usually cross the blade somewhere along its edge. 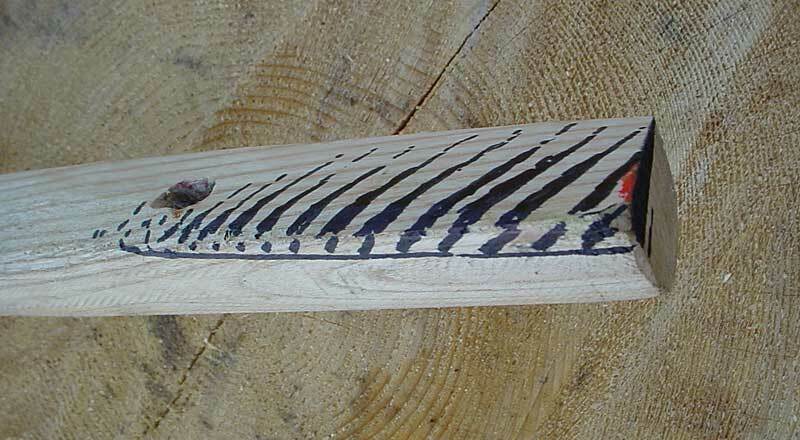 Even within the range of so-called Austrian pattern blades, there are many variants of this tilt. 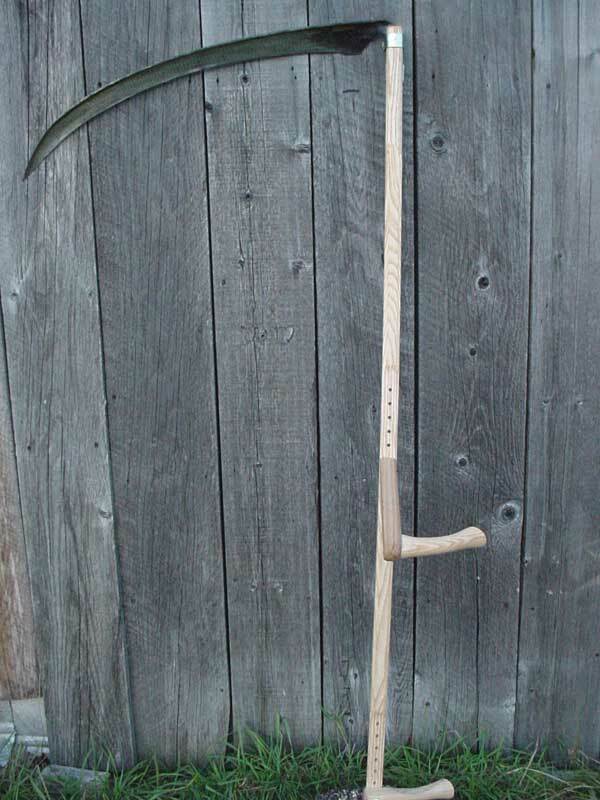 If they are not considered while matching blades to snaths, an otherwise perfectly good scythe can “misbehave”, with much of the potential mowing comfort unrealized. Unfortunately, very few who sell scythes today–even the so-called “customized outfits”–pay attention to this particular slope of the tang. Most do not even notice that there is a difference between blades in this respect, and if they do notice, they don’t really know why it is so or how to take it into consideration. 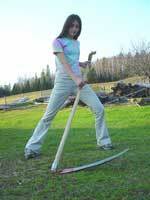 In The Blade-Fitting Challenge (The Scythe Must Dance) we alluded to the existence of this often-ignored tang angle but stayed away from a comprehensive discussion of the concept. The reason was simply that so many words are needed to “lay it out” well enough… words that were too numerous for that short mowers’ guide. With the help of digital photography we are now attempting to fill that void and take the matter of blade fitting a few steps further. Part 1 of this discussion is written specifically for those who are willing to make their own snath–be it the simpler one-grip “Eastern” style or one of many two-grip snaths. 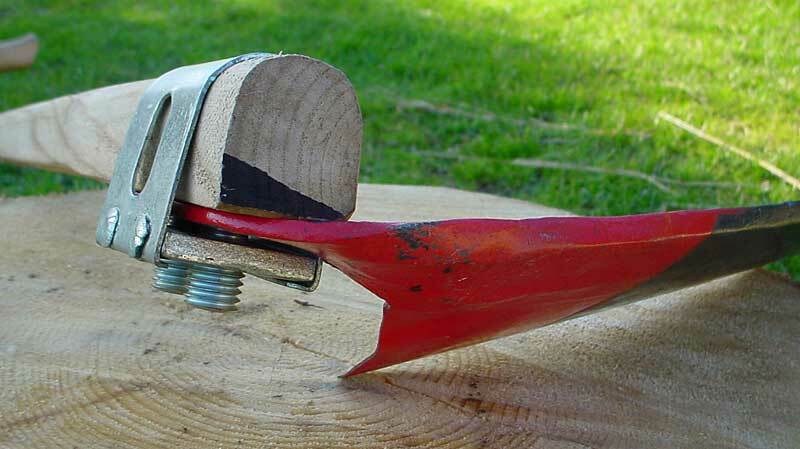 In the latter case, if the grips point toward the mower–and they don’t have to–we recommend that you attach them at an angle less than 90 degrees to the snath body. A 75-80 degree angle will provide far more freedom as you play with the horizontal balancing, and will be generally more user-friendly, regardless of what blade model you use. Nevertheless, the principles outlined below apply to all snaths regardless of their grip positions. 1. Before mounting the blade, take the snath into your hands. Lightly drag its end across the ground in front of you in an arc from right to left, simulating the full mowing movement, but slower. Without the blade you can “tip” the snath easily one way and then the other. Tilt it repeatedly throughout the stroke while paying attention to where it it feels best in your hands. Do this until you determine your preferred wrist position. 3. Fix this grip position in your mind (or have someone observe from the front to help you remember). 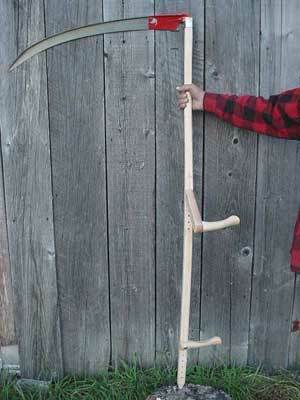 Steps 1 to 5 above are very seldom carried out by those who commercially “customize” scythes–or, for that matter, by most of their new owners. Nevertheless, this “balancing guide” is here to help you avoid at least some of the body discomfort often associated with mowing. 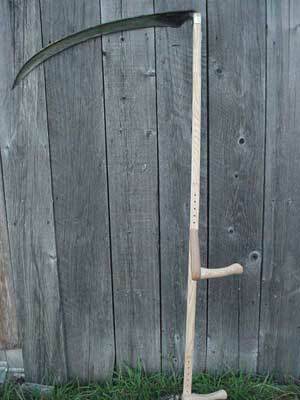 It is possible to start with the parameter of body comfort and adapt the scythe to it rather than vice versa. So if the blade does not lay on its “belly” (though with the point slightly lighter-feeling than the beard) while you maintain that personal wrist comfort, follow with the steps below. “floats” about 15cm/6″ off the ground. than shown will remedy the point-too-high condition. and it will cut grass evenly without the need to “compensate”. While makng the adjustments above, “measure twice, cut once” is an appropriate rule. In many instances very little wood needs to be taken off; 3mm. or one-eighth inch at a time is enough between re-testing. 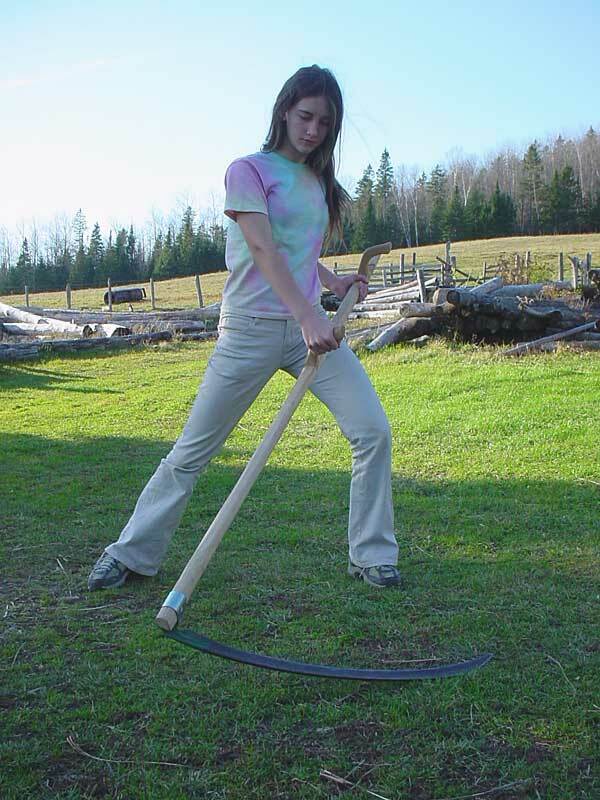 NOTE 3: If you do the test above with the average “Austrian-style” scythe, its blade will likely contact with its beard first and the point will “float” some distance above the surface. A bit of floating is OK (and–depending on mowing style–desired in some regions) but you obviously cannot cut an even stubble with the point of the blade riding 10cm/4″ higher than the rest of it. b) compensate for this high point too much, with the result of digging it in the ground.